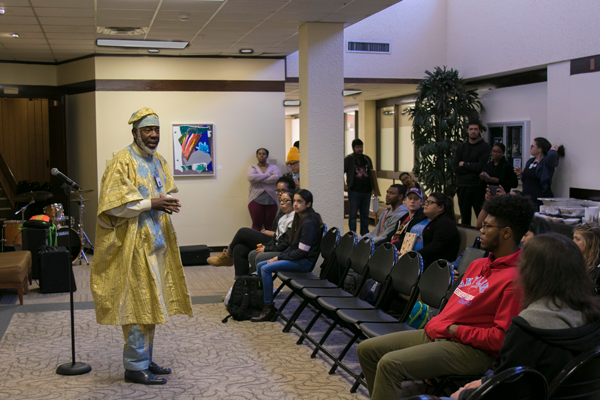 Eastfield kicked off Black History Month celebrations today with a read-in and storytelling event, looking at traditional stories to emphasize the impact of black culture in America. More events are planned on campus throughout the mont, including a DNA experiment, a look at hair in black culture and musical events celebrating black history. For more information, see our calendar below. Traditional storytelling and selected readings that celebrate the experiences, music, culture and traditions of African-Americans. Extract your own DNA and learn more about genetics. Learn about the history and traditions of an authentic New Orleans Mardi Gras. Explore the work of Cantoinette Studios’s wearable head wraps and speak to an on-campus natural hair expert. Jonathan Jones uses current hip-hop music to inspire action and leadership beyond Black History Month.